The Golden Globes is an award ceremony that recognizes actors, actresses, movies, and television shows for their cinematic excellence based on the opinions of 93 members of the Hollywood Foreign Press Association. This annual event takes place in January at the Beverly Hilton Hotel in Los Angeles, California. Thousands of celebrities made an appearance at this event where the most memorable entertainment moments of the year are highlighted, but only a select few take home the coveted trophy that classifies them as the best in their respective categories. 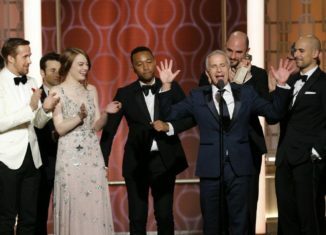 This year the Golden Globes were held on January 8th, and all over the country, entertainment fans tuned in to see if their favorites came out victorious. Each year, the Golden Globes include a well-known celebrity host for the big night. This year, audiences were lucky enough to have the very entertaining Tonight Show host Jimmy Fallon as the master of ceremonies. Although the winners and nominees change each year, the categories stay relatively similar. The decision about the winner is taken into serious consideration by the Hollywood Foreign Press. Before watching the Golden Globes, I had a few of my own winners in mind. However, after watching the Golden Globes, some of my predictions did not play out as I had anticipated. While all of the winners deserved their victory, there were others who were equally as impressive. Perhaps the most deserving was the mini-series depicting the trial of O.J. Simpson. It is based on a true story and is very empowering. The Golden Globes is an unique awards ceremony that truly can’t be compared to any other. It is known worldwide and leaves a huge mark on history, changing almost all of the lives that have stepped up on that stage to retrieve a trophy.